The equipment and the controls architecture used for a system’s make-up is critical to its success and proper equipment selection is directly influenced by the tasks performed in each area of a system. That’s why Integrated Systems Design has a broad selection of components and products available to address a multitude of system requirements. Raw materials as well as in-process and finished goods often need to go through a storage and retrieval process. Integrated Systems Design offers a number of products to accommodate both manual as well as automatic storage and retrieval of goods. From shelving, pallet racks and lift trucks to fully automated storage and retrieval machines and customized inventory location software, we have a solution that fits your requirements without breaking the budget. Distribution of goods is a non-value added but necessary activity for most industries. Labor for staging and picking goods, prior to shipment to a distribution or retail location, needs to be kept to a minimum to ensure maximum profit. Integrated Systems Design can offer and integrate virtually every picking and putting method available today. We’ve also developed some methods to improve the efficiency of the process that no one else offers. Costs need to be controlled wherever possible and one opportunity is through use of manifesting and shipping software. By automatically staging and loading product in the proper sequence and cubing out a vehicle as much as possible, significant savings for transportation cost can be realized. Integrated Systems Design can integrate manifesting and shipping software into your process and improve your bottom line. 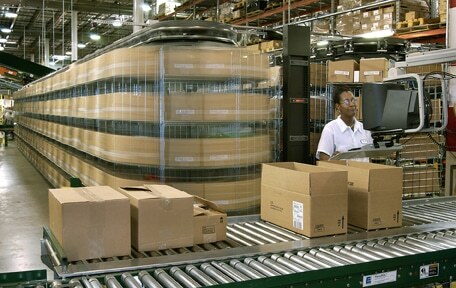 Simplify and streamlining material handling operations is necessary to stay competitive. Automation, when properly matched and applied to an operation, can dramatically change the way a company operates, its ability to service its customers, and increase profits. Let ISD show you how to determine which system will successfully reduce operational costs, minimize inventory quantities, and increase daily throughput.